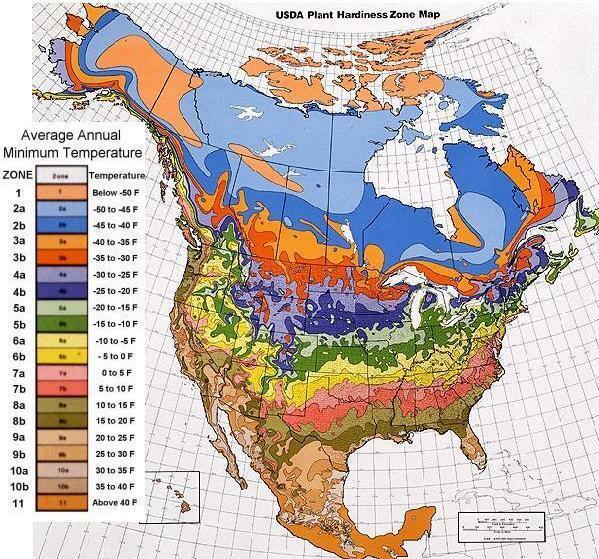 Below you will find a variety of plant hardiness zone maps for the United States. 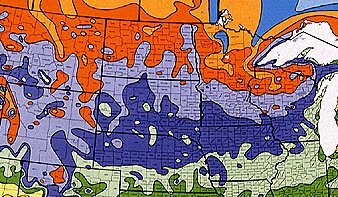 These maps also show the average annual minimum temperature throughout North America. Your local nursery, most garden centers, as well as seed, plant and tree catalogs usually show the plant zone for many of the bushes, flowers, vegetables and fruit trees they offer. Although buying perennials suited to your local climate will not guarantee 100 per cent success with your plantings, it will substantially improve the chances of their surviving for years to come. Find the color of your local plant zone by scanning the regional plant zone maps to pinpoint your location. 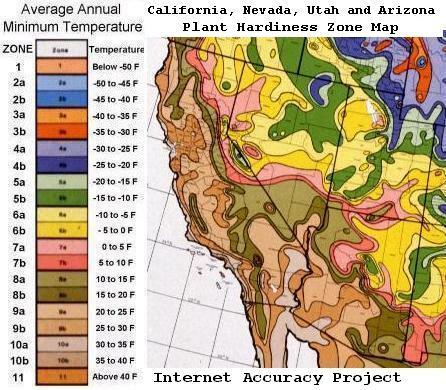 Now consult the color-coded chart at the left of the North American plant hardiness zone map to determine the numeric zone. Use your precise local plant zone to find flowers, vegetables and shrubs most appropriate for your area. U.S.D.A. 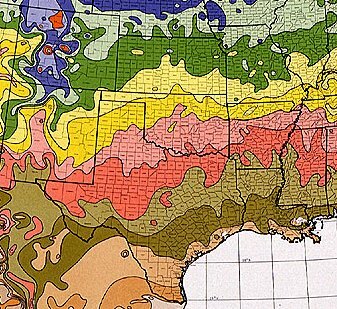 plant hardiness zones 2-10 on this map have been subdivided into light and dark-colored sections (a and b) that represent 5° F (2.8° C) differences within the 10° F (5.6° C) zone. 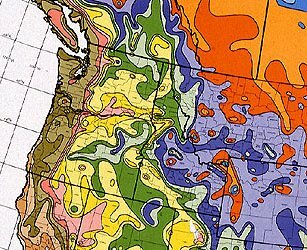 The light color of each zone represents the colder section; the dark color, the warmer section. Zone 11 represents warmer areas where the average annual minimum temperature is above 40° F (4.4° C) and are therefore essentially frost-free. Each of these zones represents an area of winter hardiness for the plants of agriculture and our natural landscape. Areas located at an extremely high elevation are traditionally considered unsuitable for planting crops and thus may not bear appropriate zone designations. There are also island zones that, because of elevation differences, are warmer or cooler than the surrounding areas and are given a different zone designation. Note that many large urban areas carry a warmer hardiness zone designation than the surrounding countryside. These maps contain as much detail as possible, considering the vast amount of data on which they are based and their size. * Stress Factors - Acid rain, gaseous and particulate pollution, security lighting, and toxic wastes, among many other stress factors, have significantly increased the potential for unsatisfactory performance of landscape plants. * New Plant Management Systems - New techniques of planting, transplanting, watering, fertilizing, and providing pest control measures have done much to increase the vigor of landscape plants. But used unwisely, these same measures can actually reduce plant hardiness. * Artificial Environments - We have pushed the use of plants into totally artificial environments such as malls, rooftop gardens, elevated decks, and buildings where plant roots are totally removed from the ground and its warming influence. The assortment of plants that can adapt to such environments is proving to be rather limited. Hardiness ratings alone are inadequate to guide landscapers in selecting the most successful plants for these artificial environments. 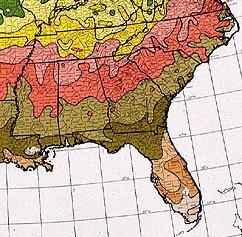 This newer version of the U.S. Department of Agriculture plant hardiness zone map supersedes the 1965 version. The new edition shows in detail the lowest temperatures that can be expected each year in the United States, Canada, and Mexico. These temperatures are referred to as "average annual minimum temperatures" and are based on the lowest temperatures recorded for each of the years 1974 to 1986 in the United States and Canada, and 1971 to 1984 in Mexico. Note: The minimum temperatures shown on this map are the average minimum temps. Keep in mind that temperatures can and occasionally do get colder than indicated on this map. 6b -5 to 0 F -17.8 to -20.5 C Clovis, New Mexico; Hartsville, Tennessee; Branson, MO. 9a 20 to 25 F -3.9 to -6.6 C Devils Den, CA. ; Houston, Texas; St. Augustine, FL. 9b 25 to 30 F -1.2 to -3.8 C Blythe, California; Brownsville, Texas; Fort Pierce, FL. 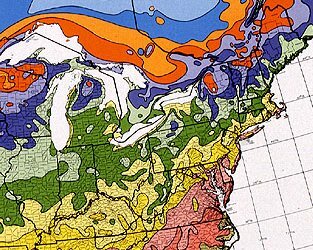 Visit our page of freezing temperature climate maps to determine the mean date of last freezing temperatures, the mean date of first freezing temps, the median length of freeze-free period, and the annual precipitation for your area.